Linda Popovich is a freelance photographer and writer living in Seattle, WA. Her photos have been published in a number of regional, national, and international magazines and online travel magazines. She has photographed everything from schooners and yachts to classic automobiles, wildlife, gardens, aircraft, marinas, bars, walking trails, wineries, tourist attractions and panoramic scenery around the world. Her work has been published in Australia & New Zealand, Aviation History, Beer & Brewer, Beer Connoisseur, Blue Water Sailing, Canadian Yachting West, Classic Boat, Collectible Automobile, Compass Holland America Onboard magazine, 48 Degrees North, Garden Answers, Global Living, Gorge Guide, Harbors in-flight, Lost Treasure, Northwest Travel, Oregon Coast, Pacific Horticulture, Spaceflight, Spirit of Ireland, Vegan Health & Fitness, Walking New Zealand, Washington Tasting Room, RealTravelAdventures.com, GoNomad.com, TravelPostMonthly.com, Winesworld.com, Travelmag.co.uk and several other print and online media. Linda has done contract work for Alaska Marine Highway, Gorge Guide, and numerous luxury resorts, villas, hotels and spas. She frequently provides the images for her husband, Roy Stevenson's, magazine articles (www.roy-stevenson.com). Prior to her photography career, she spent more than 25 years in the corporate world which included living and working in Asia and Europe for several years. Living internationally provided an abundance of inspiration for her love of travel and photography, which she continues to avidly pursue. Linda's specialties include travel photography and property photography. In addition to these categories, she also loves photographing nature, wildlife, pets, and anything else that keeps her outdoors or takes her to new places. 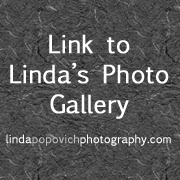 For samples of her work, you can visit her photographer’s website/gallery LindaPopovichPhotography.com. PDF clips of articles her images are also available upon request.